Got the pioneering spirit? Take a boat trip down a challenging and as yet unexplored 8 km stretch of the Loire between Meung, Baule and Beaugency, a half hour south of Orléans. And not just on any boat – a ‘toue cabanée’ or an authentic replica of the boats used by the sailors - who navigated the royal river in the olden times when it was the hub of prosperous, bustling maritime trade. 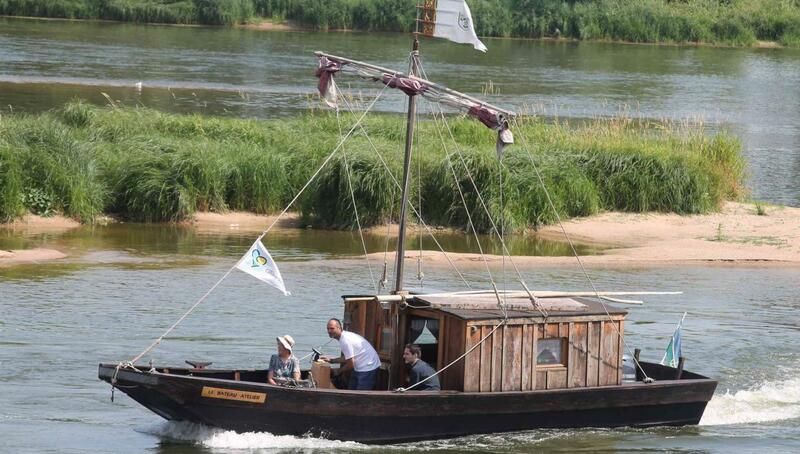 So welcome aboard the Coeur de Loire’s ‘Boat Workshop’, a 9.3 m, 6-passenger ‘toue’, listed as a National Heritage Boat, and set off to discover the many secrets of the Loire: its famously treacherous currents, its diverse landscapes and wildlife and magically shifting light, its history and its legends. The tours last from one to 3 hours, depending on the option you choose. Take the Discovery Tour for an introduction to art of navigating, the longer Luxury Ride for more on the glories of the Loire inland waterway fleet, the Wildlife Tour, armed with binoculars and a factsheet, or the Picnic or Sunset Ride and enjoy a delicious snack en route. You can also spend the night onboard in a comfy double bed and fall asleep to the sound of gently lapping waves. Bring your own dinner and heat it in the galley or head to the Auberge Louis XI in Meung, just 50 metres away. Enjoy breakfast on deck (incl. in the price) and listen to the birds sing as they herald in the new day. An unforgettably romantic experience! As the ‘Boat Workshop’ is moored at the Jeanne d’Arc pier in Meung-sur–Loire, you’ll be near the city center, and only 500 meters from the famous ‘two-faced’ Château de Meung and the enchanting Jardins de Roquelin. So be sure to squeeze in some extra time for sightseeing and don’t forget to add the charming medieval town of Beaugency to your hit list. The tours (minimum 4 to 6 people) take place daily, all-year round, weather permitting.